Barb Wire Leather Cords 2.5mm round, metallic color - golden. 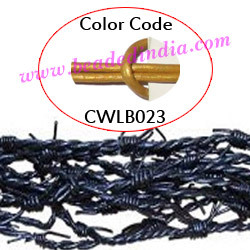 supper quality 2.5mm round barbed wire leather cords, metallic color - golden as per the photograph, pack of 25 meters. Leather Cords 1.0mm (one mm) round, regular color - carbon grey. Leather Cords 2.5mm (two and half mm) round, regular color - sky blue. Leather Cords 0.5mm (half mm) round, metallic color - ice blue. Silver Plated Metal Chain, size: 1.5x7mm, approx 12.8 meters in a Kg. Sterling Silver .925 Brushed Beads, size: 20x9x7.5mm, weight: 1.48 grams. Leather Cords 4.0mm flat, regular color - deep pink.